- Mechanical weathering takes place when rocks are broken down without any change in the chemicals of the rock. - Rocks are usually torn apart by physical force, rather than by chemical breakdown. - There are many different forces that break rocks down. These include, things such as confined energy as the Earth's crust slowly moves. - When tons of pressure build up, the resulting mechanical effect can be that very large joints, or faults are created. - There are three different kinds of mechanical weathering. - Frost Wedging: Alternating freezing and thawing of water. 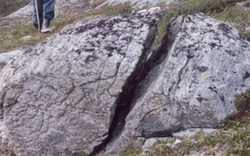 - Unloading: Large masses of igneous rock are exposed by erosion and entire slabs begin to break loose. - Biological Activity: Activity of organisms, plant roots, burrowing animals, and humans.